Arnebia sp. 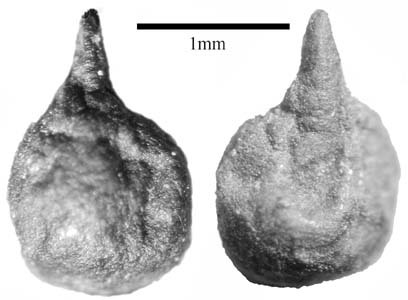 endosperm from Jerf el Ahmar 533. These are endosperms which have been released from broken achenes and are quite common. The the achenes of this genus are bio-mineralised and may survive without charring. They are very numerous on Near Eastern sites. Because many are found in the uncharred state some specimens may be modern.